See Oscar-winning film To Be Alive! at SC Johnson’s Golden Rondelle Theater in Racine, Wisconsin. “It shows the world through the children’s eyes, where there is no room for prejudice or arrogance.” – Dwight Eisenhower, on To Be Alive! When the World’s Fair opened in New York in 1964, most companies used their exhibits to trumpet the virtues of their products. But our third-generation leader H.F. Johnson, Jr. had a different idea. He wanted to celebrate life, instead. The result was our company's film To Be Alive!, which became one of the fair’s most popular exhibits. More than five million visitors saw the film in the specially built “Golden Rondelle” theatre that housed it. Crowds often waiting as long as two hours to see it. Later, it won the 1966 Academy Award for Documentary (Short Subject). The 18-minute film was directed by Francis Thompson and Alexander Hammid. It is a look at life around the world, celebrating how kids in different cultures grow up and become adults. It was shot in numerous locations in the United States, Europe, Asia and Africa. To Be Alive! was a perfect example of H.F.s unique and adventurous vision, cultivated throughout his life, and still alive and well in his familys company today. When the World's Fair ended in 1965, The Golden Rondelle Theatre was dismantled and transported to Racine, Wisconsin, home of SC Johnson,s global headquarters. The building was redesigned by Taliesin Associated Architects to fit on our Frank Lloyd Wright-designed campus. Today, it continues as a theatre for company and public events. 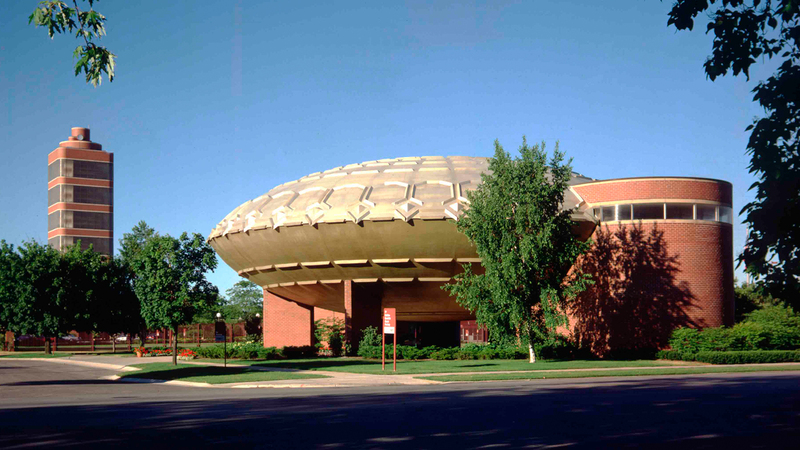 The Golden Rondelle Theatre in its permanent location on the SC Johnson global headquarters campus. To Be Alive! can be seen at The Golden Rondelle Theatre in Racine as part of our headquarters campus tours. Reservations are required, and our tours and films are free for visitors. See The Golden Rondelle and experience the remarkable optimism of our Academy Award-winning film, To Be Alive! The film runs about 20 minutes and is free for visitors.